The South Dakota Department of Transportation (SDDOT), City of Hartford, Sioux Falls Metropolitan Planning Organization (MPO), Minnehaha County, and Federal Highway Administration (FHWA), have identified a need to study the 1-90 Exit 387 interchange. The study includes an Interchange Modification Justification Report (IMJR) and associated environmental investigation. Learn about the study area, process, and study expectations that will guide the development of the project alternatives. Documents developed during preliminary research, analysis, visioning, and community input will be provided for review and input. You can get involved by reviewing the project overview and study documents, attending the public meeting, then submitting comments to the study contacts. Hartford Area Fire & Rescue Station (305 South Street, Hartford, SD 57033). 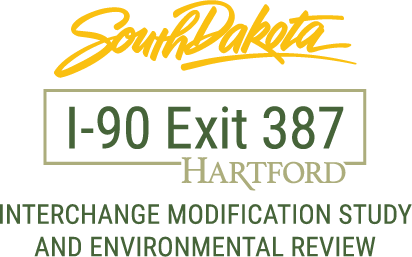 The South Dakota Department of Transportation (SDDOT) in conjunction with the City of Hartford and the Sioux Falls Metropolitan Planning Organization (MPO) will hold an informal, open house style public meeting to discuss and receive public input on the upcoming I-90 Exit 387 Interchange Modification Study and Environmental Review. An introductory presentation will be given at approximately 6:10 p.m. The study area for this project includes the I-90 Exit 387 interchange and the Western Avenue corridor between Mickelson Road (260th Street) and 261st Street. Input from this meeting will aid in the selection of preferred alternatives for Exit 387 and Western Avenue, which will be used to develop both the Interchange Modification Justification Report (IMJR) and the Categorical Exclusion (CatEx) document. Notice is further given to individuals with disabilities that this open house/public meeting is being held in a physically accessible place. Any individuals with disabilities who will require a reasonable accommodation in order to participate in the open house/public meeting should submit a request to the department’s ADA Coordinator at 605-773-3540 or 1-800-877-1113 (Telecommunication Relay Services for the Deaf). Please request the accommodations no later than 2 business days prior to the meeting in order to ensure accommodations are available. Questions and comments regarding the study may be directed to Steve Gramm at (605) 773-6641 (steve.gramm@state.sd.us) or Ben White at (605) 221-2651 (bwhite@hrgreen.com). Written comments will be accepted until December 10, 2018, and may be submitted at the public meeting, through the website, or directly to one of the project contacts. WOULD YOU LIKE A PROJECT REPRESENTATIVE TO CONTACT YOU?